TD's only concert in Germany in 1986 took place in the concert hall of Cologne's radio station WDR. The 300 tickets were given for free to the listeners of WDR, but die-hard fans from all over Europe found ways to get tickets and met up there. The first hour of TD's 100 minute performance was broadcast live and gratefully recieved by German bootleggers who made Relativity from it, giving the previously unreleased compositions quite morbid names. It is a limited edition of 100 numbered copies, 80 of which come on black vinyl with a neutral cover and a green insert sheet with fantasy track titles. 10 copies on multicoloured vinyl have a neutral cover with a brown insert, another 10 have a full-size photo cover, photo labels and the insert printed on a transparent sheet. Both multicoloured series are numbered from one to ten. 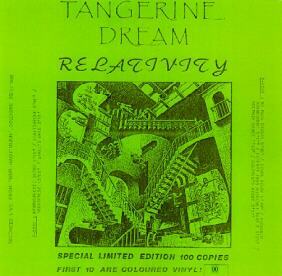 This bootleg became obsolete due to the release of Tangerine Tree Volume 58: Cologne 1986 and Tangerine Leaves Volume 53: Cologne 1986.